The Selkirk Concession was a land grant issued by the Hudson's Bay Company (HBC) to Thomas Douglas, 5th Earl of Selkirk, in 1811. The HBC held a commercial monopoly in Rupert's Land, consisting of the entire Hudson Bay drainage basin. 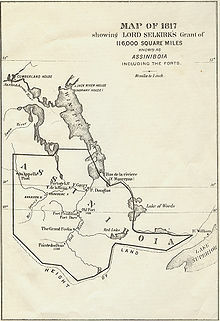 The Selkirk Concession, also known as Selkirk's Grant, included a large section of the southwest area of Rupert's Land, bounded: on the north by the line of 52° N latitude roughly from the Assiniboine River east to Lake Winnipegosis, then by the line of 52° 30′ N latitude from Lake Winnipegosis to Lake Winnipeg; on the east by the Winnipeg River, Lake of the Woods and Rainy River; on the west roughly by the current boundary between modern Saskatchewan and Manitoba; and on the south by the (mostly very slight) rise of land marking the extent of the Hudson Bay watershed. This covered portions of present-day southern Manitoba, northern Minnesota and eastern North Dakota, in addition to small parts of eastern Saskatchewan, northwestern Ontario and northeastern South Dakota. Lord Selkirk referred to the area as the District of Assiniboia and planned to create an agricultural colony there. To do so he populated the territory with impoverished people from Scotland and Ireland. Lord Selkirk had been profoundly upset by the poverty his people faced and believed that emigration to Western Canada would be their salvation. In return he was to provide the Hudson's Bay Company with 200 employees per year, allow for the company to set up trading posts in the colony and to give land for company employees when they retired. In 1812 the first settlers arrived when Miles MacDonell brought a small group of Scots to the colony. By the 1830s agricultural production of flour was over 50,000 pounds, with over 1,000 settlers residing at the colony. The promise of free land ensured there was no shortage of settlers arriving at the area. By the 1850s the Hudson's Bay Company lost interest in providing financial aid to the colony. In 1867, the United Kingdom had passed the British North America Act, creating the Dominion of Canada from British holdings in the eastern portion of British North America. In 1869 the HBC "sold" Rupert's Land (received compensation for surrendering its trading monopoly back to the British Crown) to the expanding Canada. A lack of attention to concerns of the existing Red River settlers, Métis, and aboriginal groups caused Métis leader Louis Riel to establish a local provisional government to negotiate the political treatment of the local population in the handover to Canada, resulting in the Red River Rebellion of 1869-70 and Canada agreeing to create the province of Manitoba – on land that had been part of the Selkirk Concession – in 1870. ^ Friesen, Gerald (1984). The Canadian Prairies: A History. Toronto, Canada: University of Toronto Press. p. 70. ISBN 0-8020-2513-7. ^ Gibson, James R. Farming the Frontier, The Agricultural Opening of the Oregon Country, 1786-1846. Vancouver, B.C. : University of British Columbia Press. 1985, pp. 10-13.